After such a fun weekend away in Chapel Hill with my grad school friends I arrived home craving veggies, as I often do after lots of eating out and travel. 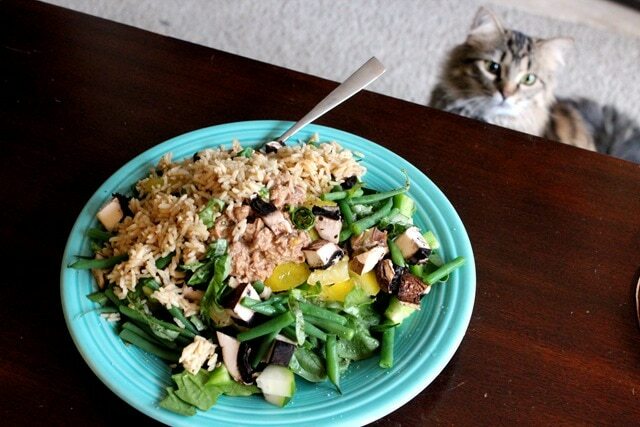 For lunch yesterday, I made myself one of my standard favorites: a ginormous salad. The secret to making a lunch salad that’s satisfying is to make sure to add some carbs (I love grains on top of salads) and a healthy fat (usually avocado + oil in the dressing). 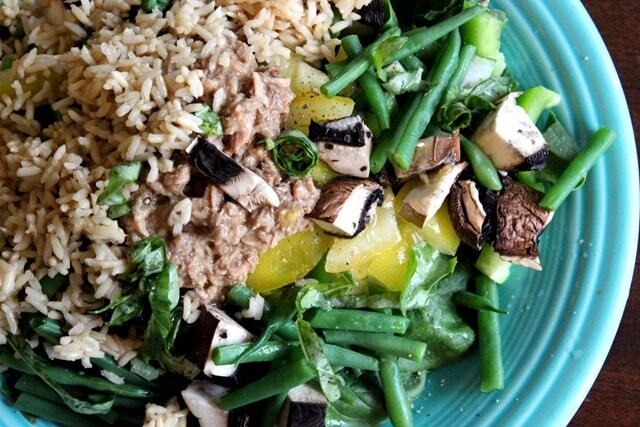 Yesterday’s creation was spinach, string beans, mushrooms, cucumber, yellow tomato, fresh chopped basil, avocado, some 90 second brown rice, and for protein I threw on some canned tuna. I mixed the tuna with homemade balsamic vinaigrette (dijon mustard + oil + vinegar + lemon juice). So tasty and satisfying! I tossed some cracked pepper on top, too. For dinner last night, I whipped up some kale chips as an appetizer while Matt and I cooked. Kale chips are easy to make and really tasty: just remove the leafy green portion of the kale from the stems, then massage some olive oil into the leaves. Toss a little salt, pepper, and/or other spices on to taste, then bake for about 10 or so minutes at 350. 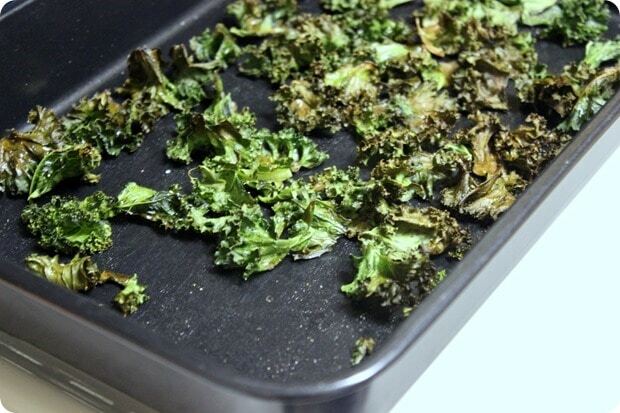 The key is to make sure the kale is in a single layer on the baking sheet, and that you haven’t used too much oil – don’t want to weigh the leaves down. 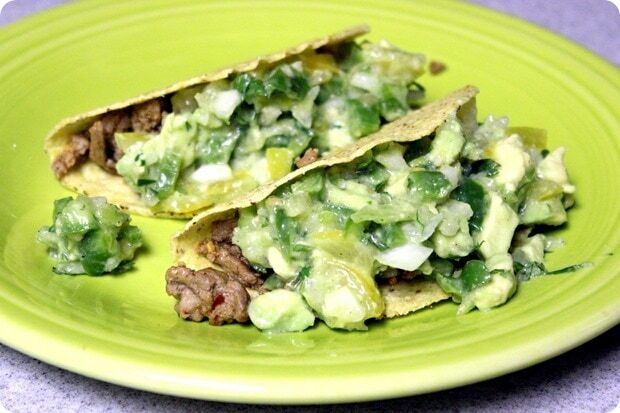 We demolished the kale chips in minutes, then moved on to the main course: a fun twist on tacos! The first layer in the tacos was some ground turkey cooked in a little taco seasoning. Part two was a homemade guac/salsa mix Matt made using avocado, yellow tomatoes, cilantro, onion, and green pepper, plus some cracked pepper – it was SO delicious and fresh tasting. I may or may not have gone back for another taco. :) I was hungry last night! And now, time to get back to work! I have some AnneTheRD client work to attend to today and I also need to come up with the third exam for the course I’m teaching at GW – I’ll be giving it to the students on Thursday morning. Speaking of teaching, I’d love some advice from those of you who have taught before because I’m trying to decide whether or not to teach again in the fall. Basically, between all my jobs (blog + private practice + teaching + occasional corporate wellness presentations + EAC) I’ve been completely overloaded this spring. I think it’s pretty obvious by now that I do well/thrive best when busy, but I’ve definitely reached my limit the past few months and I’ve found myself basically working from 8 a.m. to 11 p.m. every weekday to get everything done, which is not something I want to keep doing. So, my question is: how much less work is it to teach a course for the second time? I don’t want to be as busy again in the fall as I have been the past few months, but it also seems like kind of a waste to teach a class once and not benefit from all the hard work I put into creating all the materials (lectures 2x/week, exams, assignments, projects, etc.) for the course. Thoughts? What would you do? Those tacos look awesome! 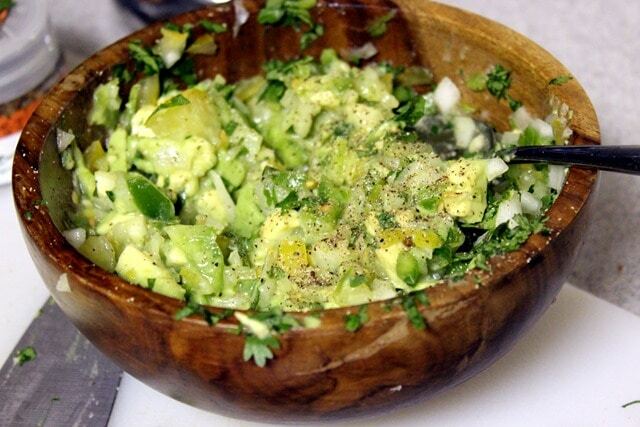 We love making guacamole, too…. when we lived in TX for two years, we picked up a molcajete (basically a stone mortal and pestle) so you smash it all in there. Sooo good. To answer your ques about teaching, teaching the same course for the 2nd time is significantly less work b/c you can reuse your lecture notes and just slightly update the exams/assignments. In grad school I was a teaching assistant and asked to do the same course each time, which saved me a lot of time. The grading will probably be what will take up the most time, but prepping for classes should be much quicker the 2nd time around! I have taught introductory nutrition classes in the past and I can say with confidence that it is definitely easier the second, third, fourth time you teach a class! The first time is always the most work. Your work won’t completely disappear, but you can still teach a class and well with much less work. I usually just tweaked lectures, assignments, so that it was fresh for me and the students. If you find you have time, I think you could do it again. I teach drug education courses, and I have to say I definitely felt like this the first few times I taught the course. I had to develop everything from scratch and it was a lot of work. After that, things were much simpler. I found a lot of my energy was going into actually CREATING all of the materials. After that process was done, it was much less time-consuming and used less energy to just pop open Word and look at my Lesson Plan for the day. Although I don’t have an answer for grading papers. Still trying to figure that one out for myself! I agree with the others–teaching a course again is a lot less work! I am a grad student and teach undergrad classes. Even when I re-teach a class, I always make changes, but they don’t take nearly as much time as prepping the class in the first place. Also, you can do some of that a little at a time over the summer. I would say go for it–you’ve already sunk a lot of time into preparing the class. The second time around will be better, easier, and more fun. You also know now what worked and what didn’t, so you’ll be a lot more succesful. Make notes now while they’re still fresh in your mind so you don’t forget what you would do differently next time. Anne, I agree with Mary. You already have your lesson plans,lectures,and tests prepared. There will be slight adjustments you will make as you see the make-up of your class, the personalities, the way your students learn, but if you really enjoyed the experience, I would give it another try, then reevaluate to see if this is something you would like to keep in your life. If you turn out to love it, this could take the place of some of your others activities . I used to have a million irons in the fire, got a part time teaching job which I did for 6 years and found it was my true calling. You just never know until you give it a real shot. Hope that helps as much as your blog and great gluten free recipes have helped and inspired me! Sounds yummy! FYI-Trader Joe’s sells cans of “Tuna for cats” and it’s quite tasty (I haven’t tasted it per se, but Sonoma my cat loves it) and that way, I can keep the chunk white tuna for myself! I don’t know what the difference is, but my two cats actually hate TJ’s Tuna for Cats. 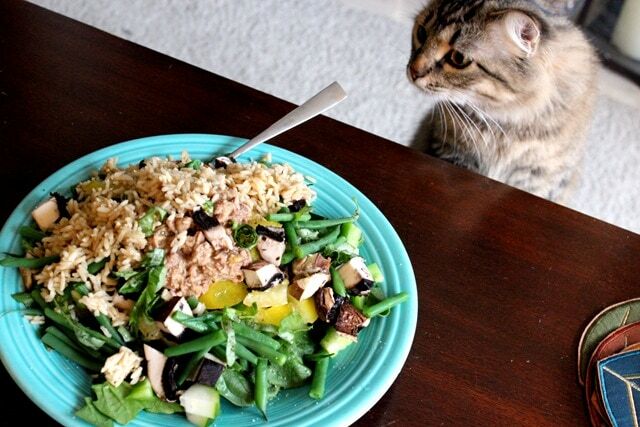 They love “human” tuna! I wonder if it has to do with the mercury? And maybe they also have to add certain nutrients in it that are not in plain tuna? That would be my guess! I’m a teacher- a public high school science teacher- and I can tell you that it’s MUCH less work the second time around! You don’t have to start from scratch and you’ll get a lot better at it too. Every year I recycle some items, modify some items, and create new items. My students benefit because every year I get better materials and better at my job, and I benefit because I don’t have to spend as mcuh time! I keep all of my materials saved in a binder and on a flashdrive. Everytime I do a lesson I make notes on my hard copies of how things went, what I would like to change, etc. Then I have ideas on what to change the next time around. I usually prefer sandwiches for lunch as salads never seem to fill me up for long but now that I think of it, maybe it’s because they don’t contain enough carbs/healthy fats. I’ll try adding a bit more and see if it makes a difference! Do you still have an afternoon snack if you have a big salad for lunch? I find I don’t really need one when I have a sandwich but it becomes essential after a salad. Hungry Annie = Hangry Annie! I totally get hangry, too. I more or less always have an afternoon snack since we eat a later dinner, but the amount of snacking I do definitely varies based on hunger! In terms of teaching, I haven’t put together a full course but I do teach a course. Even with the material prepared for me I found the first go around to be a way bigger time commitment than the second. The second time I really knew what I was in for and didn’t have to spend the same amount of time pre-prepping for each class. So I think it would be do able. That being said, you know your other time commitments best and you dont want to burn yourself out! 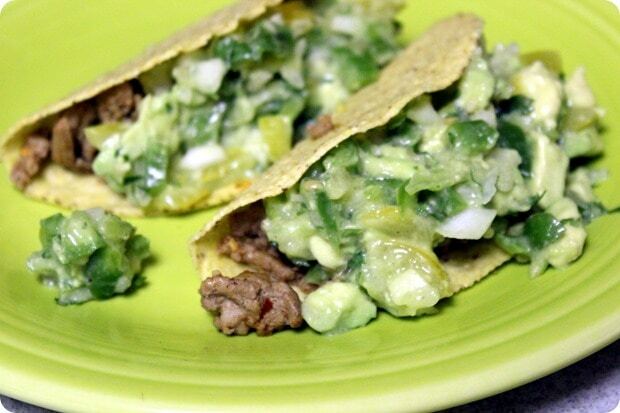 This tacos sound really good! I always crave veggies after traveling too. Just something, healthy clean and light after eating out so much. I don’t have any experience teaching, but have 3 best friends who are teachers, and from what I hear, it gets a lot easier! Year one is always the hardest, so I hope you get some relief soon! Hmm… what sort of fuel are you doing on your long runs? Yeah I would def try fueling during the run! Ginormous salads are my life! I eat them DAILY and when I say Ginormous, I say, even GODZILLA and BIG FOOT would be satisfied if they ate my salad! LOL! Anne, I’m so impressed with your example of balancing a healthy lifestyle with a busy schedule. Thanks for being inspiring! I always use the 90 second rice. Great invention. Giant salads are the best. My husband always says you can’t eat ALL of that. Great tip about adding healthy carbs to salad. Didn’t occur to me, but makes perfect sense for a salad with “staying power” and keeps the taste buds happy, too! Thanks! 2nd to 100th time teaching easy-peasy. Starting with the 5th time, someone could wake you up in the middle of the night and you could teach that class. Homework, assignments, grading, etc. of course always take work, quite a lot depending on the class size and if you have a grader or not. Maybe, you can ask for a grader? Loving those tacos and the HUGE salad! 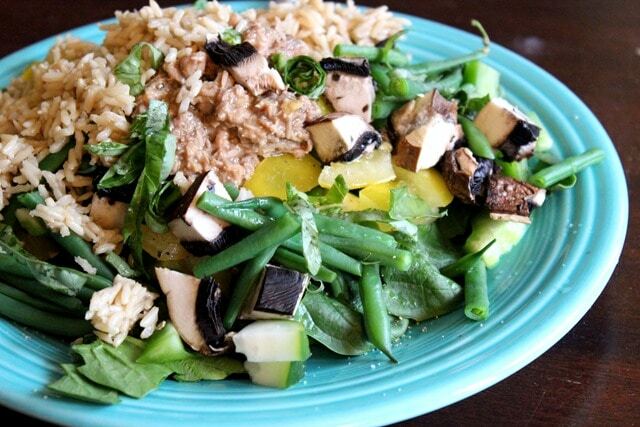 Loving making up the weekend during the week with a TON of veggies. Haha I like that guac to meat ratio of those tacos. Love guac! Teaching is DEFINITELY easier the second time! Grading takes a while always but the rest gets much better. It’s worth doing it again for sure:) plus, you really can do some of your prep over the summer. You are seriously super woman! Those tacos look incredible. I had tacos last night….perfect easy weeknight meal. Must try ground turkey next! :) Trying beef for the first time in 12 years today…eek! Excited and nervous at the same time! I used to always feel I need grains to have a satisfying meal but I’m all over fish at the moment and eggs! Avocado and nut butters are staples too! Your tacos look great! I love using ground turkey in my tacos — the turkey really absorbs the flavor of the taco seasoning. So good! My favorite taco seasoning is Penzey’s Bold Taco seasoning. It’s a little spicy and very flavorful! You’re welcome. Oh, you can find the spice at: http://www.penzeys.com. And if you use coupon code 21458C, you’ll get a free fajita seasoning, and coupon code 16650C will get you a free Frozen Pizza Seasoning (one of their blends). Happy shopping! Way late on this one, but that’s because I haven’t read any blogs all week bc I’m a teacher and I’ve been busy! Anyway as an adjunct bio professor I have to say that it gets SO MUCH EASIER the second time around. If you love teaching, stick with it because it will get easier and it is worth it. If you like everything else you are doing more than teaching a class, maybe let it go so you can focus on those things.